Fiegen Construction had an opportunity to take on a project that doesn’t come along very often: helping a television station get up and running in its brand new quarters. KSFY-TV teamed up with Fiegen Construction and Koch Hazard Architects for the design and renovation of approximately 20,500-square-feet of space on the first and second floors of the Courthouse Square building in downtown Sioux Falls, South Dakota. 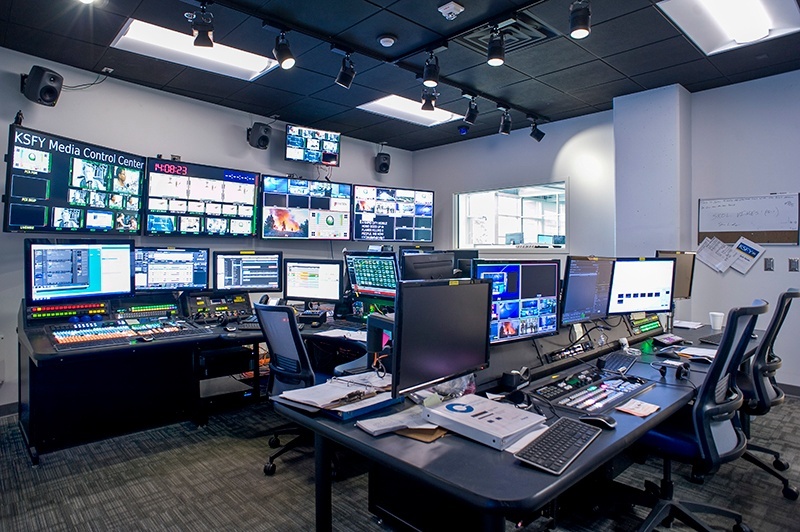 This design-build project called for construction of a state-of-the-art studio with production facilities and offices, support spaces, and a newsroom with a glass feature wall. One of the most challenging aspects of the $3.2 million project turned out to be the design and construction of an offsite satellite farm to support the station in its new quarters. The first floor at the Courthouse Square location houses the television studio, the newsroom, and various production facilities. The second floor is home to the sales department and executive offices. 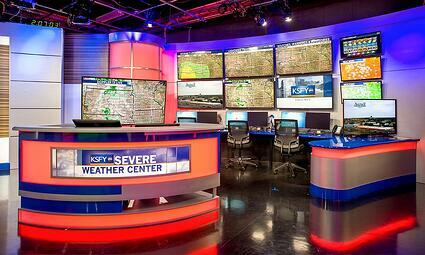 KSFY was thrilled about the opportunities afforded by the television’s new facilities. The new location allows KSFY to maintain its presence in downtown Sioux Falls. Since 1972, KSFY’s studio and operations had been housed in the 300 Building on North Dakota Avenue. Build-out had to be carefully timed. Extensive planning and coordination were required because access to several areas was very limited due to the extremely secure requirements of several of the building’s existing tenants. Fiegen Construction’s extensive design-build experience allowed for quick turnaround on changing circumstances. Design-build can reduce cost and increase flexibility—a major benefit on the KSFY project. Our project superintendent was Aldon Van De Stroet; project manager was Terry Boomsma. Team architect was Koch Hazard Architects with mechanical/electrical engineering services by Associated Consulting Engineering, Inc. We also worked with structural engineering firm RISE Structural Associates, Inc. The logistical issues with multiple satellite dishes—originally slated to be located on the roof of the building—were challenging, too. The satellite dishes had to be repositioned to a remote site due to security requirements of the existing tenants, a late-breaking stipulation discovered just months before the stations’ launch date. But a solution was expeditiously created. After KSFY station owner Gray Television located and purchased land with fiber optic availability, Fiegen created an entire second team to complete all required scopes of work for the satellite dish site in time for the launch date. KSFY was happy with our team’s work. KSFY-TV is an ABC-affiliated television station licensed to Sioux Falls, South Dakota, United States. It broadcasts a high-definition digital signal on VHF channel 13 (also the station's virtual channel via Program and System Information Protocol, known as PSIP) from a transmitter near Rowena, South Dakota.